description Create 3D Text without ever leaving SketchUp! Just type the Text string you want, pick your Font, click OK. Edit capability too. Now works with Pro and Google SketchUp! Enter the string or phrase of your choice. 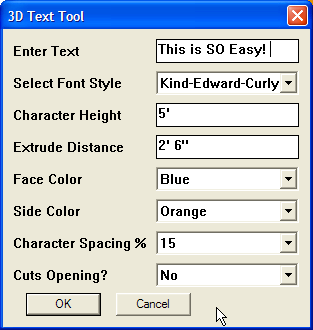 There are two fonts distributed with the 3D Text Tool: Smustard and King-Edward-Curly. Many other fonts sets are available here. You choose the height of the 3D Text string in model units. Height is measured from the first character of the Text string and all other characters are scaled to match accordingly. By default, the 3D Character Component files are all shipped 2D. If you specify an Extrude Distance, the 2D Characters will be extruded to 3D by the distance you specify. Using a negative distance allows you to create an engraved look. You can pick the same or different colors for the sides and top face of the 3D Text. The color names used are those defined to SketchUp. Note to Windows Users: For colors out of the scroll range of the drop down box, type the first letter of the color you want, then use the Arrow keys to scroll through the list. You can choose the spacing value as a precentage of average character width. Normally, specify No. Specifying Yes works well with engraved text. Clicking OK will cause the 3D Text creation process to start. It can take a couple seconds, but soon enough, the 3D Text will be ready for insertion. There is also Edit capability. Just right-click and the same dialog will appear with the text string populated. Additional 3D Character Components (fonts) may be purchased through Smustard and you can create your own 3D Character Components. For information on creating your own fonts, contact info@smustard.com. An Install / User's Guide (PDF) is part of the .ZIP package you will get, along with the Ruby Script and the two font sets. The install is not complicated, you just have to make note of the directory name where you place the 3D Character Components, as you will need to confirm this the first time you run the script. It is suggested you create a new directory under /Plugins called /Letters and put all the 3D Character Components there in subdirectories. This Script now works for both the PC and MAC using SketchUp V5 Pro and the FREE Google SketchUp! Usage Note: After using the 3D Text Tool to generate Text, PURGE your model of unused TEXT components. Nov 06, 2007: V1.1 Add a work around for a bug in SketchUp that causes lengths saved to the registry on Windows to be invalid.